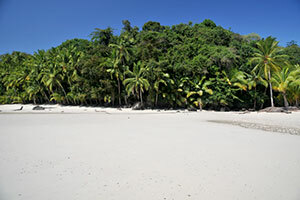 Snorkeling, diving, surfing, fishing or just exploring - at Rancho Estero we can organize any boat trip you want. Wherever you want to go, whatever you want to see! 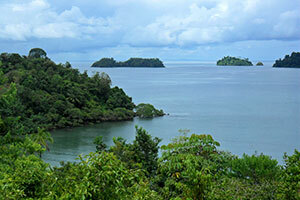 During your stay in Santa Catalina you should visit the beautiful Coiba National Park. The well preserved nature on the islands and in the surrounding underwater world has a lot to offer. While snorkeling or diving you can see colorful fish, reef sharks, sea turtles, rays and corals. On hiking trails on the main island of Coiba you might encounter howler monkeys and scarlet macaws amongst other rare animal species. At Rancho Estero we can either book you a place in one of the day-trips offered by several tour operators and dive centers or we can organize a private tour to Coiba for you, according to your wishes: one day tours or overnight trips. For multi-day trips there is also the option to stay on board a 44 foot motor yacht with experienced captain and crew, delicious meals and comfortable accommodations on the sea. 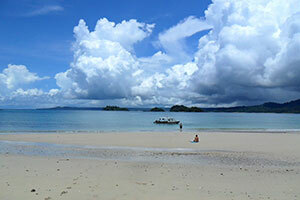 You can explore the unknown side of Coiba, away from the usual tourist attractions. In and around Santa Catalina you find some of the best waves in Central America. Only a short boat ride away there are still some secret spots without any crowds. Ask in Rancho Estero for destinations and prices. Snapper, tuna, marlin, grouper, sailfish and many more, the ocean around Santa Catalina still offers an abundance of fish. You can join local fishermen in their little "pangas", or charter your own boat with captain and crew. Rods and spear guns can be rented. Combined tours are possible as well. Contact us to find out more about the different options, availability and prices!